Seeing Arizona listed as the birthplace, or even current home state of athletes at the Winter Olympics obviously is not a common site. This is for no other reason then the climate does not lend itself to falling in love with and becoming a master at events that involve a lot of snow and cold. Before the NHL began sending players to be on Team USA – Men’s Hockey in 1998, it was even less common. With the advent of a NHL team coming to Phoenix in 1996 and the first players going in 1998, Arizona is now going into its 20th year and sixth consecutive Winter Olympic participation. This year they continue to grow the sports that they are involved in as well. Arizona will be represented not just by the 2 athletes born here, but by some who have moved to or train in Arizona. The two Arizonian natives are both going to be seen on the ice, though doing markedly different things. 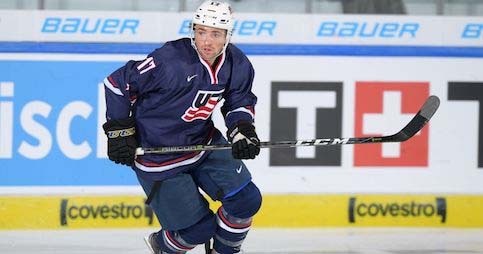 Broc Little will be representing Arizona and Team USA on the men’s hockey team at age 29. Broc Little has the distinction of being the first native born Arizonian to represent on the men’s hockey team. He was born in Phoenix where he also currently lives, is a former Bulldog and Yale graduate holding the prestigious university’s record for shorthanded goals in not only a season (5) but also in a career (7). The other athlete born in Arizona was born in Tucson and is 30 years old. Chris Knierim will be representing the United States alongside his wife, Alexa Scimeca Knierim in pairs figure skating. The couple have been skating together for 6 years now, and were wed in 2016. They call San Diego home, and it is the first Olympic appearance for both of them. Other winter Olympic athletes that have ties to The Grand Canyon State are Phoenix’s current resident Matt Antoine, who is known as America’s “Skeleton King,” and brought home the first medal in skeleton after a 12-year draught with a bronze in Sochi 2014. Another current Phoenix resident and winter Olympian is Elana Meyers Taylor, a seasoned member of the 2-women bobsled team. She has two medals from previous Olympic appearances – a bronze from Vancuver and a silver from Sochi. The 2018 Winter Olympics are being held in Pyeongchang, South Korea. The opening ceremony aired on Friday, Feb. 9 on NBC, and the Olympics is set to close on Feb. 25.